For more than three decades, the National Superintendent of the Year® Program has recognized and celebrated the tremendous accomplishments and contributions school superintendents from all 50 states have made in their local educational communities. 2016 Leadership for Change: The Superintendent as Education's Thought Leader. 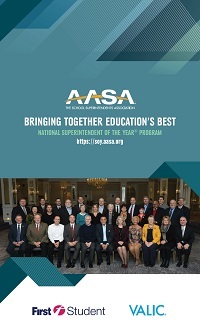 2015 Leadership for Change: The Superintendent as Education's Thought Leader. 2014: Leadership for Change: Policy and Student Data. 2013 Leadership for Change: Current Challenges and Future Opportunities Facing Public Education. 2012 The Shifting Education Landscape - Advocating for Student Success.